In a severely obese person, excess adipose tissue hanging downward from the abdomen is referred to as a panniculus (or pannus). A panniculus complicates the surgery of the morbidly obese. The panniculus may remain as a literal “apron of skin” if a severely obese person quickly loses large amounts of fat (a common result of gastric bypass surgery). This condition cannot be effectively corrected through diet and exercise alone, as the panniculus consists of adipocytes and other supporting cell types shrunken to their minimum volume and diameter. Reconstructive surgery is one method of treatment. What Does a Panniculus Look Like? 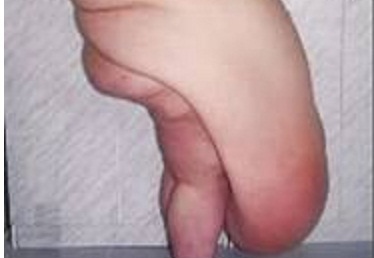 A panniculus can be a small flap of excess skin from the umbilicus downward, through to a large flap of excess adipose tissue and skin forming from the umbilicus downward to past the pelvis, and in extreme cases reaching past the person’s knees and onto the ground. The following is a good example of an extreme panniculus. (Image Source: Donated by annonymous 2011). Will a panniculus disappear if a person loses weight? The fatty (adipose tissues) will disappear after losing weight, but in cases where there is a large panniculus, the person will require plastic surgery to remove the excess skin.